Lauren Chase dribbles the ball up the court during GW's win over UMass on Jan. 20. Lauren Chase dribbles the ball up the court during GW’s win over UMass on Jan. 20. The team did so at Richmond on Sunday, demolishing the Spiders 62‒47 with runs, momentum and confidence on the road. GW’s frontcourt got shots off the block and silenced Richmond’s offensive drives – sophomore forward Kelli Prange led all players with 15 points and posted six boards, followed by junior Caira Washington who notched 13 points, eight rebounds and two blocks – but the Colonials’ fervor came from another bit of their history. For the second season in a row, the Colonials have had to recover from having a long winning streak snapped. Prior to last Wednesday’s loss at Fordham, GW was riding a 14-game win streak and toppling over conference opponents. 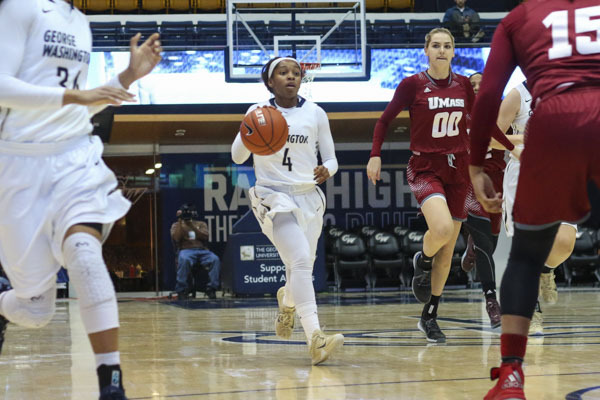 Last season, GW was cruising by the Atlantic 10 competition and on a 19-game winning streak until the team traveled to Saint Louis on Feb. 11. “I think there was some motivation to go after it [on Sunday] after Fordham because a lot of the players from last year remember the Saint Louis game that we lost when we were unbeaten in conference and how frustrating that was to go through,” head coach Jonathan Tsipis said. In both losses, slow starts doomed the Colonials. At Fordham, GW shot only 2-for-16 in the first quarter against the Rams’ defense en route to a 76‒69 defeat. Last year, at Saint Louis, the Billikens ran out to a 17‒2 lead midway through the opening half and eventually won 79‒61. In both of the wins that followed, though, the Colonials played angry. It showed most clearly on the defensive end, where GW kept its opponents under the 50-point threshold with devastating shutdowns. Against St. Bonaventure last season, the Colonials held the Bonnies to 28.1 percent shooting in a 70‒48 win. Then-junior forward Jonquel Jones and Washington each posted double-doubles. One key difference, of course, is that Jones has been inactive with a shoulder injury since the Massachusetts game on Jan. 20, but for the most part, GW’s has still been able to crash the boards and get post touches with the combination of Washington and Prange. Still, on Sunday, GW only allowed Richmond’s guard-centric offense to tally 47 points, marking the third time GW held its opponents to fewer than 50 points this season. GW currently sits atop the Atlantic 10 leader board, but still has five more conference matches, two more on the road, to clinch the top seed in tournament play. The Colonials hopes to kick-start a new win streak on Sunday against Dayton. Tip-off is set for noon at the Smith Center.